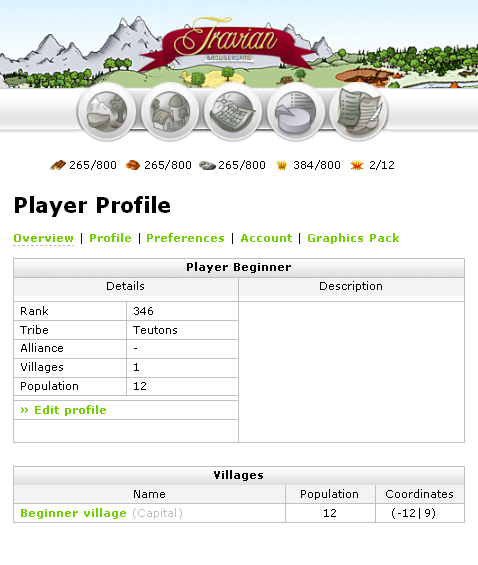 At the statistics page you can compare your village to other players villages. 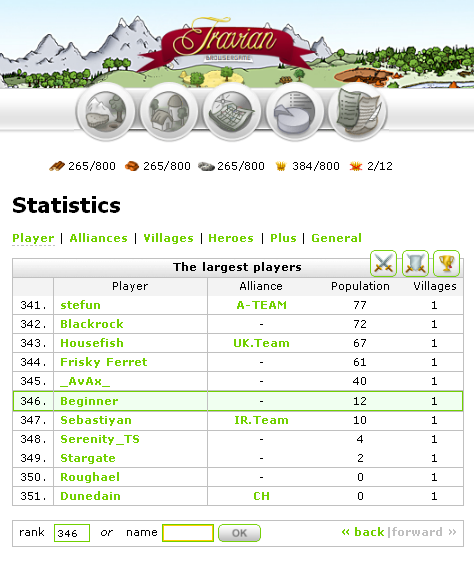 Just above the list of players you can see, you can view all of the different ranking categories, like who has the largest village, or what alliances are the best to join. The statistics page can be useful if you want to show off your stuff to friends and family, or if you just like seeing who is the best. The reports and messages pages are both important to a growing village. Reports are sent to you when you trade with someone else, are attacked or attack someone, and even when receiving reinforcements, and without this information, you wouldn't know what was going on when you were off-line. Messages can be sent by players or Travian in game staff. You can also sent messages to your entire alliance by typing [ally] as the recipient (only if you have the rights to do so) . Whether you send or receive, most messages are important. This is your player profile page, where you can make edits to your account, or even describe yourself for all to read. Look at the main task bar for the player profile page. The overview will take you to the page you are currently on. On this page you can Edit your profile and view your villages. On the profile page, you can change the name of your village, give your birthday, tell us your gender and where you live, and give descriptions of the village or yourself. 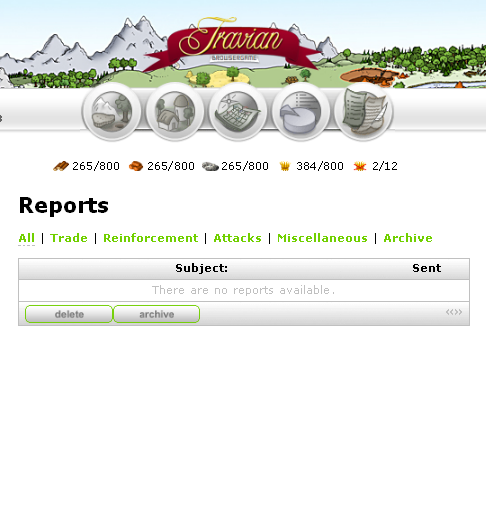 The preferences page is used mainly to change the time and which way the date is presented as well as to modify some Travian Plus features. The account page is just as it sounds, a page for managing your account. Here you can change your password, select a sitter, or delete your account. The graphics pack page is where you can download the graphics from the game onto your computer. It not only speeds up the loading time of the page, but also helps lessen the weight on the server. I would recommend doing this if you plan to play regularly, but it is not required.